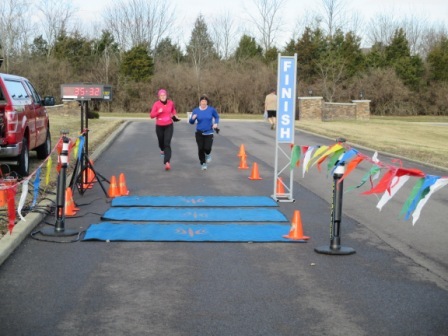 Here I am in the blue shirt finishing up the 5k. The time on the clock was the gun time, not my chip time. I finished 64th out of 116. There were 116 runners and walkers. As usual I was the middle of the pack. I finished with a chip time of 35:28. It was a slow and painful run for me. My best time is a 32:48. How can I run 8 miles one week and it doesn’t hurt like running a 5k can a week later? I pretty much have one speed. Slow. 11:05 per mile isn’t too bad for me. The sad thing is that my 5k pace is only 25 seconds faster than my half-marathon time. How can I run for 13 miles at a certain pace (11:30) and then cut that mileage down by 75% and only improve my time by 4%? Anyway, I was reminding my friend running next to me that the reasons that we run are for fun, for health, and for exercise. We don’t really run for time. But it sure would be nice to turn on the gas once in a while! We have been doing a lot of back squats in CrossFit. My old best was 125# for 5 reps. I have been working hard at the workouts and my new maximum for 5 reps is 145#. Woo Hoo! It is hard to up your max. I find that it takes quite a few sessions to feel like I am getting any better at all, but then all of a sudden, I am better. I guess it as they say, practice makes perfect. We have been running more as the new year is moving forward and between that and CrossFit, I am feeling really good. I love getting out there and getting my blood pumping and pushing myself to do things that are hard. Now, let’s get something straight, I’m not totally into working out with no other things going on in my life. I want to workout and then do the other stuff. One 1 hour workout is all I want 5 days a week. That leaves me time to rest and recover and do other things that I like. How about you? Do you workout? Do you feel better when you workout? Do you feel healthier when you workout? I have been slowly returning to my pre-pregnancy fitness level. From 6 weeks post-partum I have been walking about 3 miles twice a week. Slowly I upped the days from 2 to 3. It felt great to be doing something physical again after 7 months of inactivity. In February I started CrossFit twice a week. This is in addition to the walking. So, some swort of physical activity 5 times per week. I kept walking while my body was slowly adjusting to the intense CrossFit workouts. 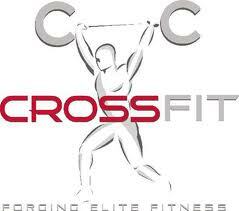 CrossFit. 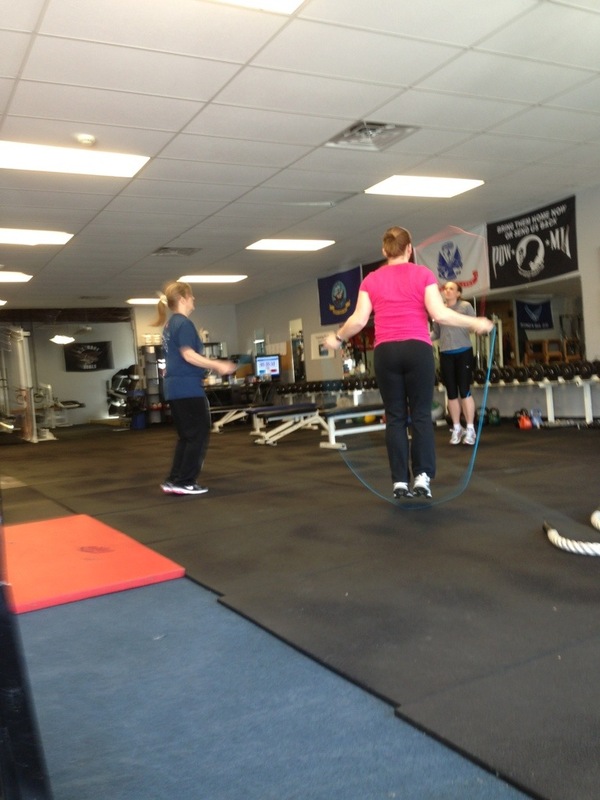 I haven’t jumped rope in YEARS! I have started running about once per week for the last couple of weeks. I have been doing intervals of 3:1. Three minutes of running and one minute of walking. At first, it was pretty hard, but with each workout I am getting better. My friend is preparing for a half-marathon, so I am upping my mileage as she does. I was able to do 6 miles this week! I am siked up! I easily transitioned from three up to six. It must be the CrossFit workouts that are helping. I love that I am able to get back into my routine of working out, even with having the baby. She is a good sleeper in the mornings, so I am able to keep her with me and still get my workouts done. I am so thankful for that! Working out is one thing that I do just for me. I do a lot for others, especially my children. Working out helps me reduce my stress, and feel better about myself. Do you exercise? Do you enjoy it? My running group met this morning to talk about our fitness goals for this year. Each of us wants to maintain or better the shape that we are in…me included. One of my goals is to be able to run a 5k without stopping by the end of the year. Considering I just had a baby 6 weeks ago, I think that is a pretty good goal. I used to be able to do that, no problem, but with no exercise since the end of May, I am really in need of improving my fitness level. 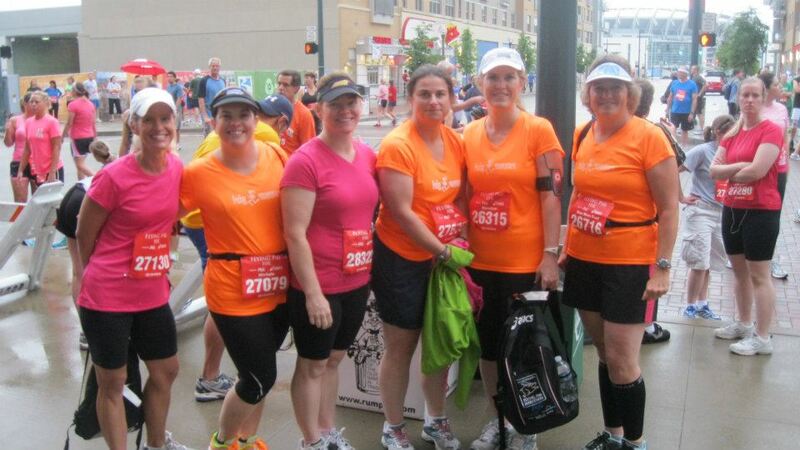 I am planning on doing a group training session 2x per week with some of the running girls. Also, I am planning to walk 2x per week with a different couple of girls in the group. I have to do something that keeps the baby out of the Y’s daycare as I don’t want her to get sick from being around all of the other children. Our Y has a stroller that we can use around the track. Right now I carry her in a sling or if there isn’t anyone else on the track, leave her sleep in her car seat while we watch her as we go around the track. There is clear plexiglass, so I can see her at all times. I still have 13 pounds to lose from this pregnancy. I have done pretty well so far, but the holiday treats have really stalled my progress. It is nice that it is the beginning of the year and I will be able to track my progress to hold myself accountable. With this plan, I will get 4-5 days a week of strength training and aerobic conditioning. Hopefully by the time the weather gets warmer, I will be able to get outside with the jogging stroller that my running friends gifted to me. My goal is to start jogging when we are able to get outside. I think that would be April at the earliest. That gives me January, February, and March to get into better shape aerobically and strength wise before even attempting to run anywhere. The group that did the 10 race on Saturday morning! I had a big race this weekend. I was planning on running the half-marathon, but for reasons, that I will disclose at a later time, I decided to walk the 10k race instead. It was a GREAT time. I walked 6.2 miles in 1:31:04. I was pretty impressed with myself. It was an average pace of 14:31 per mile. I have never really thought of myself as a runner even though I have been running for 2 years now. Walking that race killed me. I really wanted to run! Amazing to me. The hardest part of all was walking across the finish line. I so wanted to run it in! 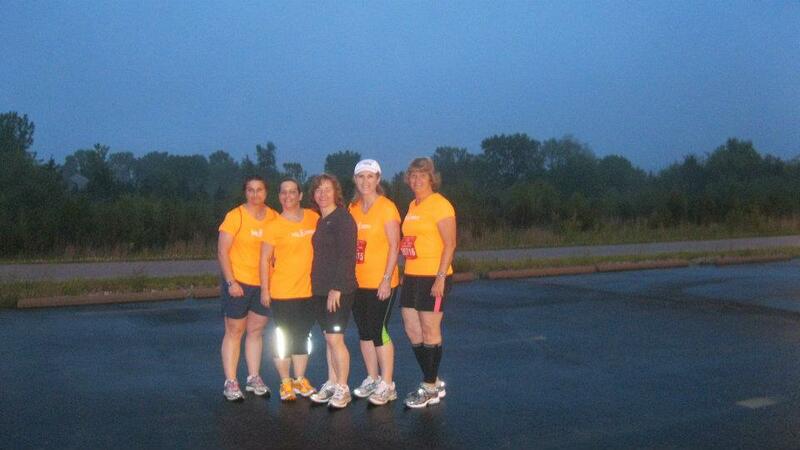 My running friends and I had a great time. Races are so much fun. It is amazing that so many people get together to support a race or special event. Half of our running group did the 10k on Saturday morning and half did the half-marathon on Sunday morning. 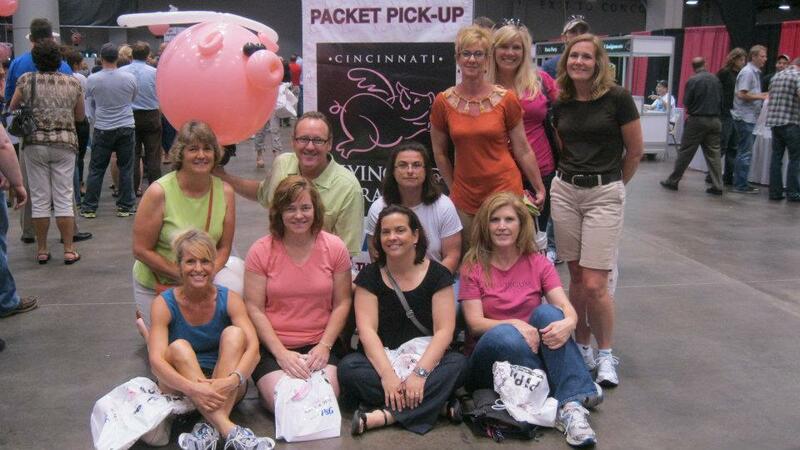 Most of our running group at the expo for the packet pickup. What a fun day! Up bright and early for the race. We met at 6:15 and took a few pictures. We met at 6:15 and took a few pictures. Then we had a 30 min ride to downtown. Somehow we picked the perfect parking garage and went up to street level and we were right at the starting line. We couldn’t believe how fortunate we were to park there. Dumb luck, I guess. with strawberries. It looked a lot like this only better. They were delicious! I think I ate more calories than I burned off! It was such fun to get together with everyone and have a fun morning! Our school held a 5k race as a fundraiser. I was glad to participate. The course was a little off, my Garmin said 3.21. It was put on by non-runners which is why I think they weren’t too specific about the mileage. I would have liked it to be accurate, but it is their first year and it was a fundraiser. My time was 36.19, which isn’t my best, but I’m ok with it. It’s not like I was going to win my age category or anything 🙂 It was fun to be out there supporting our school. My pace was 11:19. My fastest 5k was a 10:32 pace. definitely not my best, but I’m ok with that. After the 5k they had 2 kid fun-runs. A 1 mile run for the older kids and a half-mile run for the little ones. My 10-year-old did the mile, and my 7 and 5 year olds did the half-mile. It was a lot of fun for them. All of the kids got medals, which was nice. I think that makes them want to get back out there and try again. They have been wearing them proudly all day. 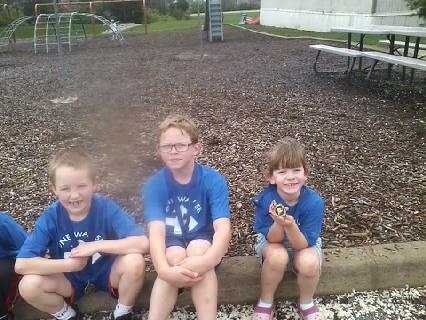 My three little runners! My daughter is showing off her medal!